While we don’t want to say it too loudly in case we scare the sunshine and warm weather away, it is spring now and this means we are slowly, but surely, swapping our hats, boots and coats for shorts, flip flops and barbeques in the garden. There are lots of exciting things you can do in summer and with the fear of the sunshine not lasting, it is not unusual to cram in as much as possible and summer is gone before you know it. This is why we want to remind you to pop your chimney on the list of things to do this summer. We know it is unlikely you’ll be visiting your modern fireplace over the next few months, so your chimney won’t be at the forefront of your mind, but summer is actually a really good time to get your chimney cleaned and in this blog post we would like to tell you why. The best way to prevent the risk of a chimney in your fire is to have a professional and certified chimney sweep to inspect and clean your chimney. This is an industry and profession that gets very busy in the winter when everyone starts using their modern fireplace again and remember that the chimney needs to be swept but book your chimney clean in the summer months and they will have a lot more availability for you. As with all small problems around the house, if they are not caught quickly and fixed or repaired then they can escalate quickly. By getting your chimney cleaned by a professional, problems can be spotted and you will be told the issues that may need addressing. Your chimney cleaner will let you know any issues that they have spotted and even help you if your chimney needs tuck pointing or repairing for example. While the smell, look and feel of a lovely warm fire is a beautiful and cosy thing, but the smell of water leakage and ashes can cause a yucky and wet build up that can smell, and this smell will travel down the chimney, into your modern fireplace and throughout your home. Your chimney cleaner will ensure that you have no leaks and they’ll remove last year’s ash so you won’t get that horrible chimney smell in your home. 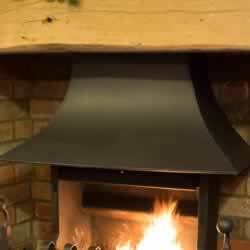 When smoke is caked on it is harder to remove so by having your chimney cleaned in the summer you will get the smoke from last year removed from your chimney, the chimney cleaner will make sure that your fire is burning correctly and this will minimise the smoke residue build up when you have fires on the go in your home this winter. Birds, squirrels and other pests love a chimney in the summer as it is somewhere cool, dry and spacious for them to nest down, but in the winter they love the fact your fire warms them through your chimney. By having your chimney cleaned in the summer, your chimney cleaner can help make sure that your chimney is not their home or squatting location for the next year. When you have your chimney cleaned in the summer you are getting the peace of mind from an expert chimney cleaner that there is no CO building up in your home and this means you are preventing the risk of carbon monoxide in your home. Has your chimney been working hard all winter? Why not give it a treat and get it cleaned this summer. For more information on why you should get your chimney cleaned, read on here. Or get in touch with a member of our team today. What Is An Inglenook Fireplace?